The space dedicated to the Gallo-Roman era has a rare interior decoration of a domus from the end of the first century. In 1995, during archaeological excavations in Bayeux, an extraordinary set of painted plaster was discovered. 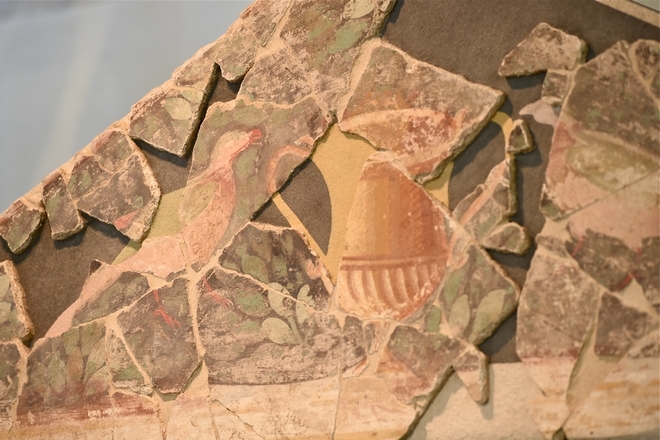 Their study and the restoration of a part of the fragments made it possible to restore the decoration of at least three rooms, belonging probably to a rich house of the last quarter of the 1st century. The best preserved parts comes from a rectangular room of barely 10m2, covered in saddle and open on all four sides. One of the walls houses a door surmounted by a pediment culminating at 2.60 m. The latter is decorated with a crater filled with fruit and framed by two pheasants standing on a foliage. At the top, a frieze hosts a set of animals (dolphin, bird) or sea monsters. Provenance: Bayeux, rue Saint-Patrice, 1995 (excavation SDAC, restitution and restoration of the decorations Center for the Study of Roman Paintings, Atelier Pro Pictura Antiqua – Soissons).